Students of Iyengar Yoga begin with elementary postures, with an emphasis on standing asanas (postures). Other postures are then added, including forward bends, backbends, twists, inversions and restorative poses. Each class ends with deep relaxation in Savasana, where students learn to rest in a profound way, completely releasing the body while drawing the mind towards the peace within. ​Yogic philosophical precepts of Patanjali's Yoga Sutras, which detail moral and ethical growth and responsibility are the underlying foundation of the program. 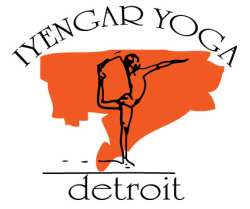 Our Certified Iyengar Yoga teachers provide students of all ages and abilities an experience of yoga which is physically energizing, and mentally rewarding. Our highly trained teachers use their deep-seated knowledge of asana to instruct, observe, and individualize corrections for each student. Deep study and practice leads the student to an overall transformation of body, mind and spirit. Special 5-week series for those new to yoga and the Iyengar method. Builds the foundation for continuing levels. For students who've completed an Iyengar Intro course, continued exploration of the fundamental asanas. Continuing students who have completed two or more Beginner Level 1 sessions. This level is also suitable for those with previous yoga experience who are new to the methods of Iyengar Yoga. Headstand and other inversions are introduced. Continuing students who are firmly established in their practice and are able to hold inversions for 5 mins or more. Experienced yoga students with at least 2 years Iyengar experience. Expect refinements, more complex poses, plenty of inversions (5+ min holds in Sirsasana and Sarvangasana), backbends, Padmasana variations, arm balances, and philosophy study. Openness, willingness, and ability to observe and learn are the most important criteria. Slower paced class with more modifications and props to accommodate students with minor physical limitations. Guided, individualized sequences for common ailments and special conditions such as back, neck, or knee pain; pregnancy, menstrual issues and more, . Learn more here. Supported, recuperative yoga poses to calm your nerves and quiet your mind. Safe women-only space to address specific needs, such as pregnancy, postnatal, menstrual and menopausal conditions; a time to nurture ourselves and support each other. Queer and trans women are welcome, as well as women who for spiritual or religious reasons prefer a women-only space. All levels and abilities welcomed.